Ages 5 through 12. Word retrieval problems are commonly observed among children with language disorders and learning disabilities. 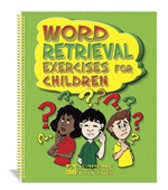 Here is a collection of enjoyable activities that can be used to facilitate word retrieval as children participate in a wide range of language and thinking tasks. Activities in which children label items, categorize words, finish sentences, give synonyms/antonyms, describe events, and give explanations are among the tasks included. The rapid naming games help children retrieve words quickly as they use vocabulary for a variety of purposes. The book also contains word retrieval tasks relating to events described in short stories. Parents can present many of the activities at home with guidance from a speech-language pathologist. Reproducible worksheets are included. Exercises for Language Stimulation. Students are asked to label pictures, classify nouns, complete sentences, make comparisons, define words, rhyme words, describe steps in completing a process, and perform various other language tasks. Topic Centered Activities. Each lesson focuses on a specific topic (e.g., Going on a Trip). Students are given practice labeling and describing items, giving word definitions, and talking about situations relevant to the topic of the lesson. Word Games. Games are included that require rapid naming of pictures, items within a category, etc. Short Stories. Students are presented with stories and asked questions related to story items and story events. Picture Card Activities. Pictures are used in activities that challenge students to categorize words, compare related items, give descriptive information, etc. The printed book edition and the CD edition are the same price if ordered separately. Save money when you order both the book and CD at the same time. The CD includes the COMPLETE BOOK and makes it easy to print out copies of the reproducible book pages. When ordering on the internet, you must use the drop-down menu to select your preferred product format.